So Paul Smith has been one of my favourite designers for a few years now and I've seen a few outfits/influencers online wearing the label but I have never seen anyone really go for it when it comes to taking complete advantage of the beautiful colour schemes that come out their collections every season. Im talking bright, bold, and fluorescent! This is what I really like about Paul Smith's collections as well as the fact that I feel like a DON when I'm wearing it in public. The wild choice of colour mixed with slick, yet slightly fashion forward design creates the perfect take on modern contemporary clothing/tailoring if you ask me. OK so the title... I name my them based on how I feel and sorry guys, this is just how I feel right now amongst my peers and fashionistas... They know this and Im sure they would also agree. You see, its generally a challenge to pull off a lot bold colour period but for me its never been a problem as I have been experimenting with this for years now. The proof is in the pudding, just take a look at my previous Paul Smith outfits below straight from street style pics online via google. 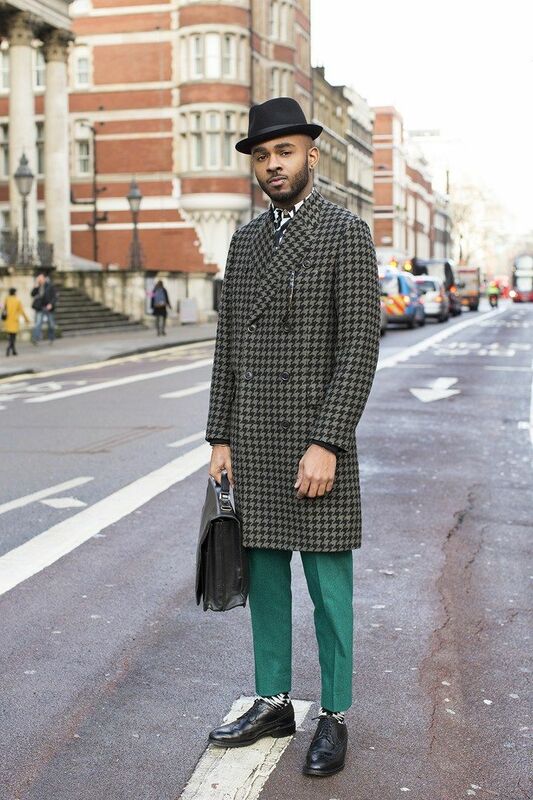 These carefully created outfits had me being papped many times on the streets of London during fashion week each season by the likes of The Evening Standard, Vogue Online, GQ as well as influentials like "The Sartorialist" and "Dapper Lou" & more. Which brings me to my latest outfit update thats made up of pieces I own from previous Paul Smith mainline collections but as you can see things are still looking very timeless and relevant which is why I still wear these products and I feel great every time. When you look at the colours of each product, this is what makes things look modern as you wouldn't normally see these types of pieces in these bold colours. When pairing colours I usually refer to what I was taught in college all those years ago. In my mind I split colours into two categories. For example, complementary colours and harmonious colours. Which is why I paired my red houndstooth blazer with my green tapered trousers as red and green are both complimentary. When I do this I am able to put things together in my mind but I'm sure my years of styling has contributed also. Overall when it comes to these types of looks, I would definitely say that trial and error with an open mind is the way forward for sure as it is all about experimentation.